Robi customer service is now at your hand, because Robi bring for its users the new and improved My Robi App! this app will help you to customize and change tariff plans, internet packages, add or delete Robi fnf, check balance, activate and deactivate SMS, MMS & others bundles etc. You just need to download and install the app and register for free! ➤ Make bill payments/account recharge, bill payment/recharge history, know the previous bills. ➤ Download your itemized bill, check the usage history. ➤ Get in-app notifications from Robi. 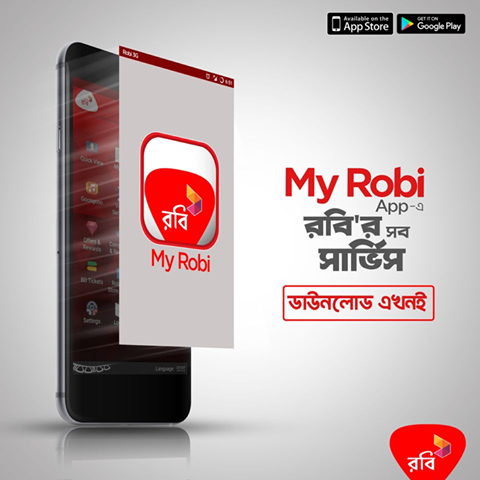 ➤ Transfer balance from your Robi account to your loved ones using Robi connection. ➤ Use the service with enhanced security measure. ➤ Use Robi Store locator, to find the nearest Robi Store near you. ➤ Add profile picture, to get a more personalized feel. ➤ Also you will be able to browse the app for FREE! NOTE: Robi e-Care is now called My Robi, so customers can search and find the app more easily.